Handheld screen area: Provides a live display of your BlackBerry screen. The size of this area can be changed by resizing the entire viaDock window, or by using View > Handheld Zoom. The quality of the handheld screen area can be set to either high quality or quick by using View > Handheld Quality. Phone controls: Includes answer and hang-up buttons, numeric keypad, hands-free and mute buttons, arrow buttons for navigating the BlackBerry and menu, select and escape buttons for controlling the BlackBerry. Display of these controls can be turned on off using the phone control button in the status bar, or by using View > Phone Controls. Keyboard: Provides an on-screen keyboard for input to the BlackBerry, suitable for use with touch-screens (e.g., Tablet PCs). 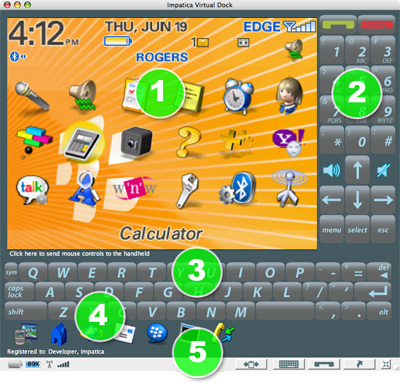 Display of the on-screen keyboard can be turned on and off using the keyboard button in the status bar, or by using View > Keyboard. Application Launcher: Includes shortcut icons for all of the applications currently running on the BlackBerry. Click any of the icons to quickly switch applications. Display of the application launcher can be turned on and off using the application launcher button in the status bar, or by using View > Application Launcher. Status Bar: Displays the BlackBerry's current battery strength, radio signal strength and incoming call notifications. Also provides buttons for showing and hiding other viaDock screen areas, turning on and off clipboard sharing and switching to mini view. Display of the status bar can be turned on and off using View > Status Bar. The mini view is a small window (shown below) that can be kept visible while using other PC applications. It provides you with ongoing status of your BlackBerry, including notification of incoming calls. Call answer and hang-up buttons are provided for quickly answering and placing calls. Hands-free and mute buttons are also available to simplify controlling your BlackBerry. A quick dial field is provided, allowing you to place a call by simply entering a phone number then clicking the green call answer button. To return to normal view, click the normal view button in the status bar.